The Real Estate Staging Association or RESA® is the trade association for professional home stagers. RESA Home Staging Awards are the leading awards honoring real estate staging mastery. The RESA Sold Over List Price Club recognizes contributions of RESA-PRO Members to having staged homes that have sold over the list price. Logos of recognition are awarded in $5,000 increments, as well as with how many times, to represent each time a home staged by a RESA-PRO Member has staged a home that sold over the listing price. 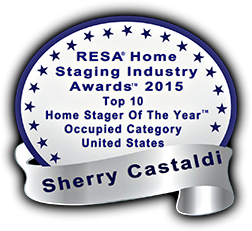 Sherry Castaldi is honored to have been prestigiously awarded as a RESA 2015 “Top 10 Home Stager of the Year” Occupied Category, United States, as well as being recognized by the RESA Sold Over List Price Club for having staged homes that have sold over the list price. Please view some of our before and after staging photos from these distinguished achievements.